Provo • If someone had told BYU fans that leading scorers Yoeli Childs and TJ Haws would combine for just 15 points and the Cougars would get just 23 points in the first half, they would probably have predicted another disappointing defeat. Then again, nobody would have predicted that freshman forward Gavin Baxter, making his first career start, would have turned in a performance for the ages, either. But both happened — Childs was held to a season-low six points and Haws had nine — as Baxter contributed 25 points and 10 rebounds, both career-highs, and the Cougars shook off a sluggish opening half and routed much-improved Loyola Marymount 67-49 in front of an announced crowd of 11,643 at the Marriott Center on Saturday night. Coach Dave Rose said at times it seemed like the 6-foot-9 Timpview High product was playing on 9-foot baskets. Using his considerable wingspan and otherworldly leaping ability, Baxter had four dunks, most of them after lobs from McKay Cannon, who had a career-high seven assists. Baxter also blocked two shots and hit a pair of 3-pointers. Trailing 26-23 at halftime and looking a lot like the team that was blown out 93-63 by No. 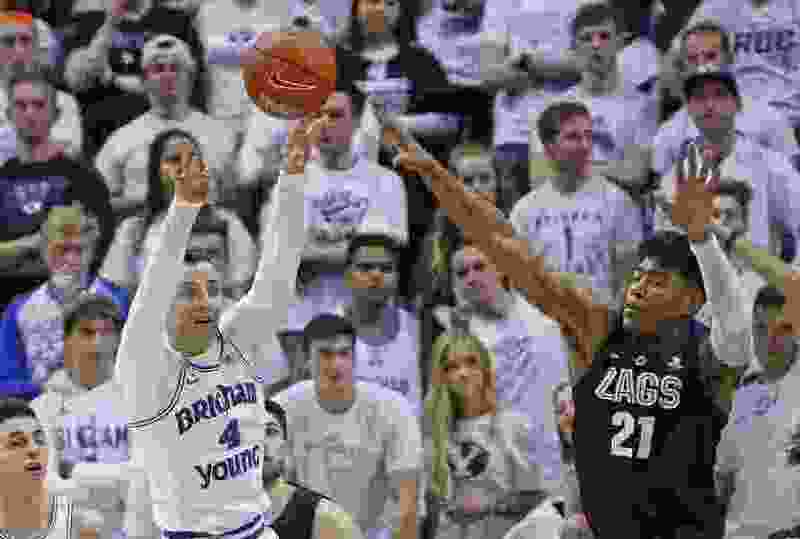 4 Gonzaga on Thursday, the Cougars flipped a switch to start the second half, and Baxter was a big part of it, along with guard Nick Emery, who started the second half instead of Connor Harding. “That first half, it looked like we were running in mud,” Rose said. Baxter tipped in a miss to open the second half, then had a big dunk. Haws’ 3-point play, his first points of the game, gave BYU a 30-28 lead and the Cougars were off and running. “All the coaches really let us have it at halftime,” said Cannon, whose biggest contribution was on the defensive end. The senior drew LMU’s crafty point guard James Batemon, who averages 17.4 points per game, as his defensive assignment and helped hold him to zero points in 30 minutes. Dameane Douglas led LMU with 10 points, all in the first half. The Cougars, who improved to 14-10 overall, 6-3 in WCC play, were also fortunate that 7-foot-3 center Mattias Markusson picked up two early fouls and finished with just nine points and six rebounds in 23 minutes. Leading just 33-32 four minutes into the second half, the Cougars went on an 18-0 run to seize control. The catalyst was Emery, who scored a season-high 17 points and was 5 for 5 from 3-point range. With Saint Mary’s downing San Francisco earlier Saturday, the Gaels and Dons are both at 5-3 in league play, so BYU is alone in second place by a half-game in the WCC standings. The Cougars play at Portland on Thursday, then return to the Marriott Center next Saturday to host Pacific.